Discussion in 'Android Devices' started by Tim K, May 11, 2012. So, last night I had my first 'signal issue' with the GN. I was laying down watching TV with my phone in my pocket. I guess it was underneath me and was unable to get a signal (speaking of which I should really go for a run today!). Anyway, unknown to me, it was without signal for a good 30-40 minutes....which I only figured out when it started heating up, probably from constantly trying to get a lock. 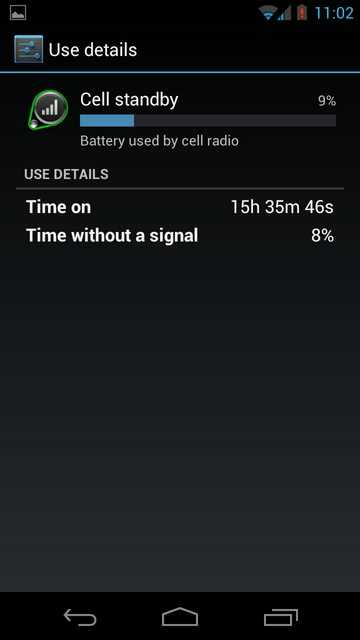 My battery had drained about 20% over this period of time. When I got up, my phone continued draining rapidly, going from 20% to 5% in about 15 minutes. It could not obtain a lock even though I had 2 'gray' bars of 4G at about -93dbm. All this time I had Wifi enabled but the lack of a cell signal was a problem. Even switching to 3G and back wouldn't give me a lock. I had to turn airplane mode on and off to regain my signal.....and then plug back in before it shut down! Anyway, I just thought I would post this for general info. My phone is back to working fine today. My guess is that the problem is related to an extended period of time with no signal....which for some reason causes the phone to be unable to reconnect once the signal is re-established. Or my phone was just pissed off about getting crushed by me. It really should not have done that with wifi on and connected to a network. Your phone should not have even been on a 3G or 4G network with Wifi on. Keep an eye on it and if it does that again make sure you don't have a defective cellular chip. You do that by turning off your wifi and forcing it to use your mobile network (3G/4G). If it cannot obtain a data connection in a known coverage area and has signal, you might have a defective chip. Happened to me on a Palm Pre. Phone got hot and the battery drained excessively and it couldn't obtain a lock. After about an hour of troubleshooting on the phone, I had to return it because the cellular chip was defective.. I have a feeling my....ahem.... large mass.... was probably blocking the wifi signal as well - especially since I was in a part of my house with weak wifi reception. Nevertheless, the problem isn't really the lack of reception or the heat, or even the battery drain. Those things are all to be expected given the situation. The real issue is that once my posterior was no longer interfering with reception, the phone should have reconnected to both wifi and data. Wifi reconnected but data did not - and the phone kept trying to connect, as it should. I'm pretty sure that your phone maintains a 3G or 4G connection even on Wifi. There is no data xfer, but the phone does attempt to maintain a connection. Yeah, I have noticed it is a little finnicky with connections. Every once in a while it just doesn't want to cooperate unless I toggle airplane mode. 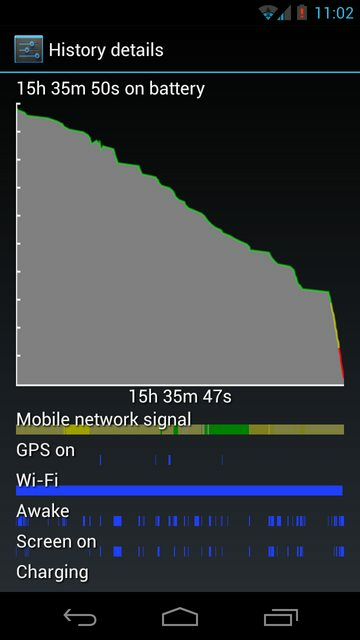 I sometimes see this "time without signal" on battery stats too. That usually happens in deep indoors where cell signal is very weak. But I didn't lose cell radio connection, just zero signal bar. It seems to me that Nexus reports the time with very weak dbm below -120 as time without signal no matter cell data connection is lost or not. Tim are you running stock or have a rom loaded? I went from around -116 to around -105 after i loaded a custom rom with the newest radios. I'm rooted running the latest 4.0.4 rom. I agree it seems to report low signal as no signal in the stats. I've seen time without signal a number of times, including yesterday but I've never had a problem reconnecting. I wonder if there's some sort of time out bug where if you are without a signal for 10+ minutes it cannot reconnect?????? I was seeing that more and more before flashing the new radios. Did you do the radios seperate? No, I was running the February leaked radios but went back to 4.0.2 then loaded the whole new 4.0.4 radios and all.